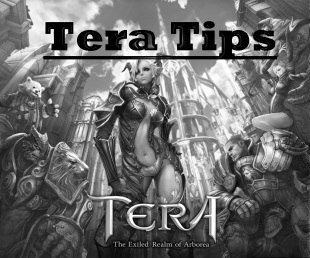 Tera Tips is a non official website, giving you help and guidance whilst you play Tera. Throughout the site you'll find information on almost every aspect of the game, the idea of this website is more as a little pocket guide to the game than a full blown eye watering and mind numbing wall of text some other sites may display. The site is created by actual Tera players, and this will be a learning curve for us, as well as you, so bare with us while information is updated/added and edited along the way! Any advice given on here is purely opinions. However rest assured the information you may find here is as accurate as possible! TERA has typical MMORPG features such as quests, crafting, and player versus player action. Combat uses a "real-time battle system" that incorporates third person camera view. The player targets an enemy with a cross-hair cursor rather than clicking or tabbing an individual opponent. Players must actively dodge enemy attacks. The player may use keyboard and mouse or a control pad to control their character.